Like most geographers, I collect maps and information wherever I travel; you never know what surprises await. Tourism publications are especially interesting since they are specifically designed (one assumes) to show the best side of the places described. My collection of tourist brochures associated with Jalisco and the Lake Chapala area dates back more than thirty years. Many early versions had stylized maps, drawn by graphic designers, not cartographers, with sound (if uninspiring) text in Spanish. English translations were often unintelligible. In the 1980s, several bilingual members of the now-defunct Association of Travel Reporters, based in Guadalajara, offered to help the Jalisco State Tourism Department improve its translations, but the offer was politely declined. 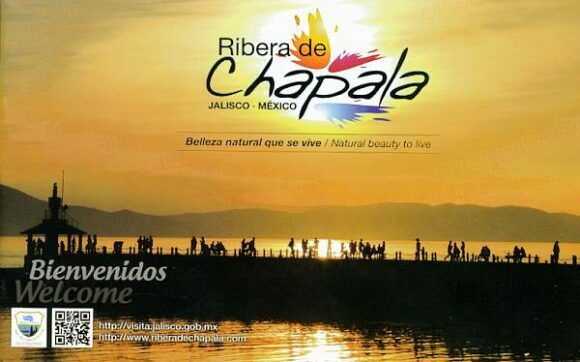 As this latest brochure relating to Lake Chapala shows, translation standards have not improved significantly since then, and remain a long way off “native speaker” level. This is particularly unfortunate, given that this area of Mexico has the largest concentration of English-speakers in the country. One has to closely experience San Juan Cosalá in order to feel and enjoy it to the most, so come and discover a place you will never want to leave, for every happy moment can be lived here, as just by visiting you feel enveloped in an affluent of joy and vitality. In getting to know it, just stroll across its Pier, or admire the harmonious architecture in San Juan Evangelista Church, or enjoy the exquisite aromas of seafood, bouncing from restaurants enlivened with fine music while walking over the Piedra Barrenada (Drilled Stone); or the rest; freshness and fun offered in thermal waterparks and world level spas. No symbol in the key for the “gas station” signs shown on the map. 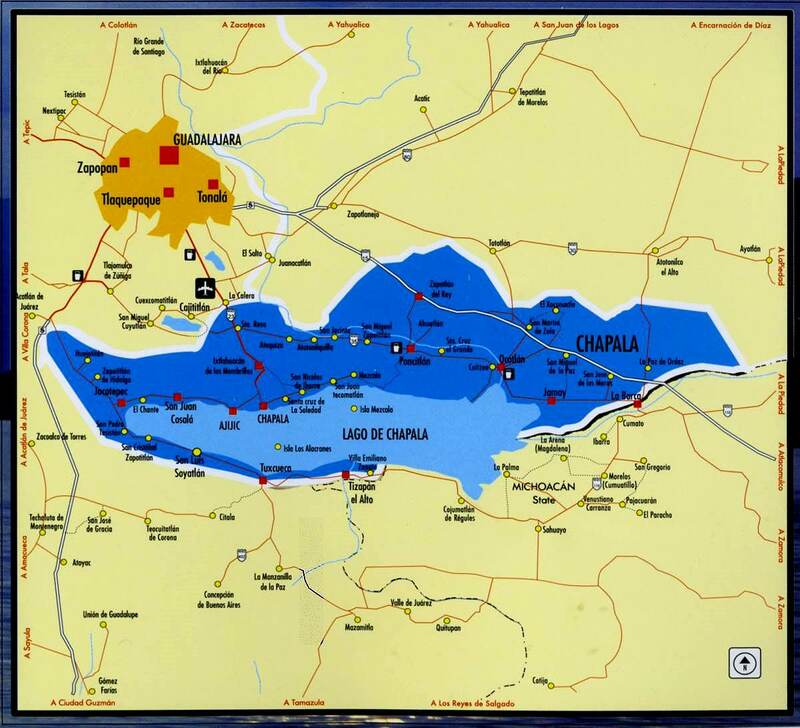 The map shows only four gas stations in this area (and none in Chapala or Ajijic); there are dozens of others not shown on the map, including several in Chapala and Ajijic. The map has no scale. The Isla de los Alacranes, a short boat-ride from Chapala, is shown a long way south of its true position, and a lot further from Chapala than it really is. The dark blue area is, according to the key, the Chapala Lakeshore. I have absolutely no idea what it really represents! Lake Chapala’s catchment area is a completely different shape to the dark blue area. The “Chapala Lakeshore” should, obviously, also include the south-east section of the lake around Las Palmas and Cojumatlán. Much of the area colored dark blue is out of view of the lake, and drains towards the Santiago River, not the lake. Placing the word “CHAPALA” in the north-east section of the dark blue area is totally misleading. The area where the word is written is NOT in the lake basin, not in view of the lake, and is not even in the municipality of Chapala. Again, I have no idea why the artist responsible for this map chose to ignore geography. It is 2016, and Jalisco State tourism officials still need to improve the quality of their brochures and maps. Come on guys! Time to up your game! In general, I find these post amusing and interesting. However, This post reads a little pretentious. We have a specialized tourism company based in Ajijic with a very active (and expensive) promotional program in Canada and the USA and other parts of the world. Over a period of seven very active years we have attracted hundreds of happy visitors and millions of pesos to Jalisco but have never been able to establish a useful relationship with the Jalisco tourism officials or make use of their materials. I can’t help but agree that maps need to be improved. But on the other side, where would we be without the charm of having multiple maps spread out on the front seat trying to figure out where we are going. And as for the Spanish to English translations, where would we be without a smiley chuckle to brighten our day with stumbling translations. But hey, I still agree – WE NEED MAPS!!! The map is useless but the description is quaint …… but San Juan Cosala ?? Not just Jalisco. ALL of mexico needs updated maps!